Applicant screening software may be all that's standing in the way between you and a job interview. To get past it, need to make sure your resume has all the relevant keywords matching the job description. That's where Jobscan comes in. Paste your resume into one text box and the job description in another, and the webapp will show you how well your resume matches. You'll also find how many times certain skills are mentioned—so you can prioritize those skills on your resume. 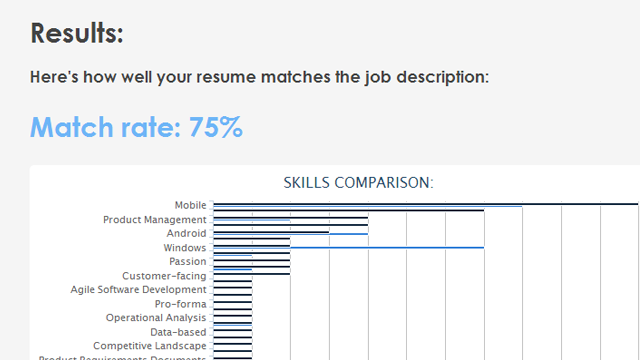 You could also use a tag cloud for this purpose, but Jobscan makes the comparison easy, especially when you're tailoring your resume to each specific job (as you should). While you're at it, don't forget to format your resume so it doesn't get trapped by the software.